1. What problems can a developer have when designing a database? 2. What is the ER-model (Entity-relationship model)? What is the need to develop an ER-model? 6. How are the entity types and attributes of the ER model implemented in real databases and the programs they manage? When designing a database and developing a software product, the most important problem is the problem of interaction between the developer and the customer. The task of the developer is to most accurately recreate the wishes of the customer when developing a database management software product. The main problem that the developer needs to solve is the correct construction of the database, or rather the schema (structure) of the database. design and convenience of the application interface. In the process of developing database management software, the developer must learn the requirements of the customer in detail. The database should be designed in such a way that it is understandable, most accurately reflects the problem being solved and does not contain redundancy in the data. To facilitate the process of developing (designing) a database, the so-called semantic data models are used. For different types of databases, the ER-model is the most well-known data model (Entity-Relationship model). An ER model (Entity-relationship model or Entity-relationship diagram) is a semantic data model that is designed to simplify the database design process. From the ER-model can be generated all kinds of databases: relational, hierarchical, network, object. The basis of the ER-model are the concepts of “essence”, “relationship” and “attribute”. For large databases, the development of an ER model makes it possible to avoid design errors that are extremely difficult to correct, especially if the database is already in use or at the testing stage. Errors in the database structure can lead to alteration of the code of the software managing this database. As a result, time, funds and human resources will be used inefficiently. ER-model – a representation of the database in the form of intuitive graphical charts. The ER model visualizes a process that defines a certain subject area. An “entity” – “relationship” diagram is a diagram that graphically represents entities, attributes, and relationships. The ER model is only a conceptual level of modeling. ER-model does not contain implementation details. For the same ER-model, details of its implementation may differ. An entity in a database is any object in a database that can be distinguished based on the essence of the subject area for which this database is being developed. The database developer must be able to correctly identify entities. disciplines that are being studied. strong type. This is an independent type of entity that does not depend on anyone. Figure 1 shows the notation for a weak and strong entity type in the ER-model. Each entity type has a specific set of attributes. Attributes are intended to describe a particular entity. arbitrary attributes. These are attributes whose value is based on the values of other attributes. For example, a student’s current course of study can be calculated on the basis of the difference between the current year of study and the year the student entered the school (if the student had no problems with study and he well studied the discipline “Organization of databases and knowledges”). 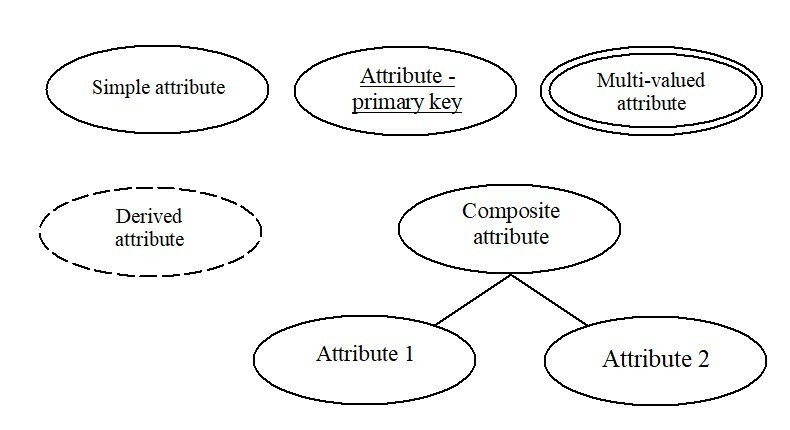 In the ER diagram, attributes are denoted as shown in Figure 2. As can be seen from the figure, any attribute is denoted as an ellipse with the name inside the ellipse. If the attribute is a primary key, then its name is underlined. realize the combination of the two approaches above. Modern software development tools have a powerful set of libraries for processing complex sets and visualizing data in them (collections, arrays, visualization components, etc.). If the database is implemented in known relational DBMS (for example, Microsoft Access, Microsoft SQL Server, etc. ), then the types of the entities are represented by tables. Attributes from the ER model correspond to the fields in the table. One record in the database table represents one instance of the entity. an attribute that is a primary key can be an integer, string, or other ordinal type. In this case, the value of each table cell that corresponds to the primary key is unique. Most often, the integer type (int, integer) appears as the primary key. 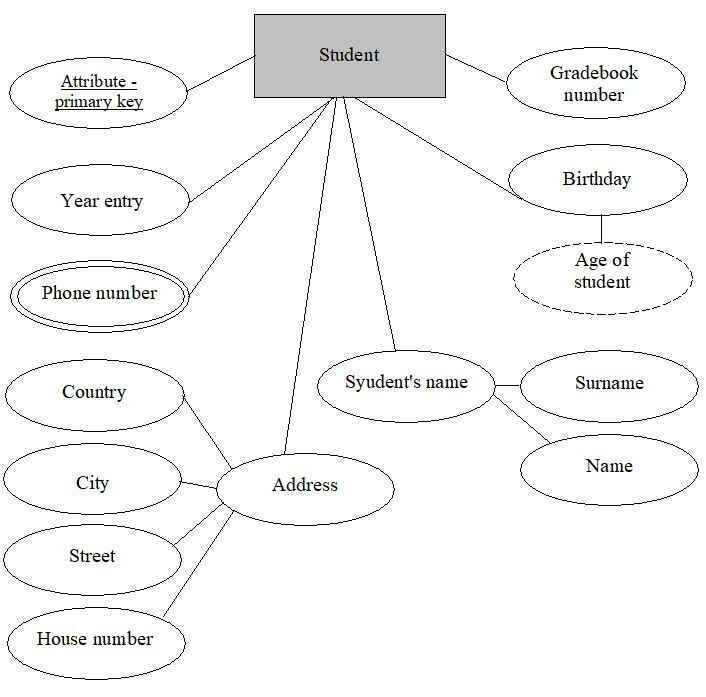 If the database is implemented in a unique format, then the types of entities must be represented as classes or structures. Entity attributes are implemented as fields (internal data) of a class. Class methods implement the necessary processing of class fields (attributes). The interaction between classes is implemented using specially designed interfaces using well-known design patterns. This example demonstrates a fragment of the ER-model for the type of entity “Student”. attribute “Age of student” is a calculated field, which is defined as the difference between the current (system) date and the value of the Birthday attribute.